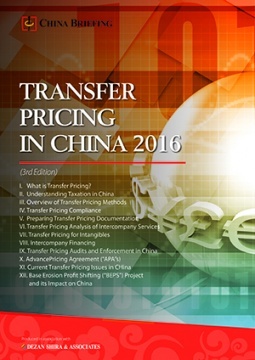 Transfer Pricing in China 2016, written by Sowmya Varadharajan in collaboration with Dezan Shira & Associates and Asia Briefing, explains how transfer pricing functions in China. It examines the various transfer pricing methods that are available to foreign companies operating in the country, highlights key compliance issues, and details transfer pricing problems that arise from intercompany services, intercompany royalties and intercompany financing. Transfer pricing is a reality for any multinational company. As a result of a globalized economy and increasing complexity in business models, tax authorities around the world are actively protecting their revenue base through the introduction of transfer pricing regimes, which focus on the taxation of profits that stem from related party transactions. These transfer pricing regimes will typically provide guidance to taxpayers on how related party transactions should be priced and how taxpayers can discharge the burden of proof that their transfer pricing arrangements comply with the arm’s length standard. If designed and implemented early in a business life, a transfer pricing system can complement and support an MNC’s business model and commercial objectives, as well as optimize its global effective tax rate. The Chinese tax authorities have embraced this growing trend of introducing transfer pricing regimes. In 2009, China formally introduced comprehensive transfer pricing regulations. Since then, China has also been a key player in the development of the United Nations Transfer Pricing Guidelines for Developing Countries, as well as the Organization of Economic Cooperation and Development (“OECD”)’s initiative and action plan on Base Erosion and Profit Shifting (“BEPS”).